This is painting is identified as a likeness of the original Auburn & Rochester Railroad station in Rochester. The structure so grand in its day that it was immortalized in this 1852 oil painting by Eugene Sintzenich, a well known American artist, measures 4′x3′. Rochester Historical Society. This engine is believed to have been the "Providence," built for the Auburn & Rochester Railroad by Norris Locomotive Works of Philadelphia in 1842. 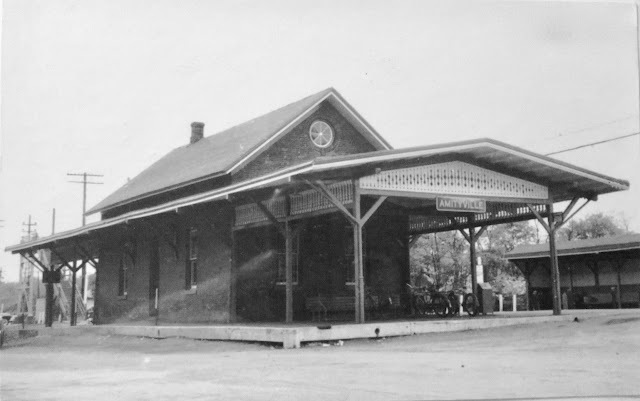 Recounting stories of railroading in days of old on the Auburn road, John R. Burke, native Auburnian now residing in Newark, tells an interesting tale in the New York Central Magazine. Original depot in Syracuse was shared by the Auburn & Syracuse and Syracuse & Utica Railroads. First locomotives on the Auburn & Syracuse looked much like this. However the driving wheels on the A&S engines were mounted in back instead of at the front of the boiler for better stability. The Auburn & Syracuse Railroad was one of links in the "chain" of lines across the state that eventually became the New York Central. Construction of the Auburn & Syracuse Railroad in the mid-1830s forms an interesting chapter in the early development of internal improvements in central New York. From the beginning, it was an Auburn project. The idea of connecting this thriving community with the Erie Canal had been a popular topic of discussion as long ago as 1828. The original plan was to build a railroad from Auburn to either Port Byron or Weedsport. Various schemes, including the incorporation of a number of railroad and even canal companies never materialized and it wasn't until 1832 that the matter of building a railroad from Auburn to Syracuse was put on the table.